We are still learning our way around the boat galley and provisioning. It’s a bit different than living on land. Our stove only has two burners so recipes that need a ton of prep and use many pots and pans aren’t ideal (not to mention limited water to wash all of them after). The fridge is pretty tiny and is only chilled while the engine or generator is running. Most of our food pantry are dry goods and canned foods. We are pretty good at stocking up on fresh veggies and fruits wherever we can and we try to be sure they are eaten before going bad. 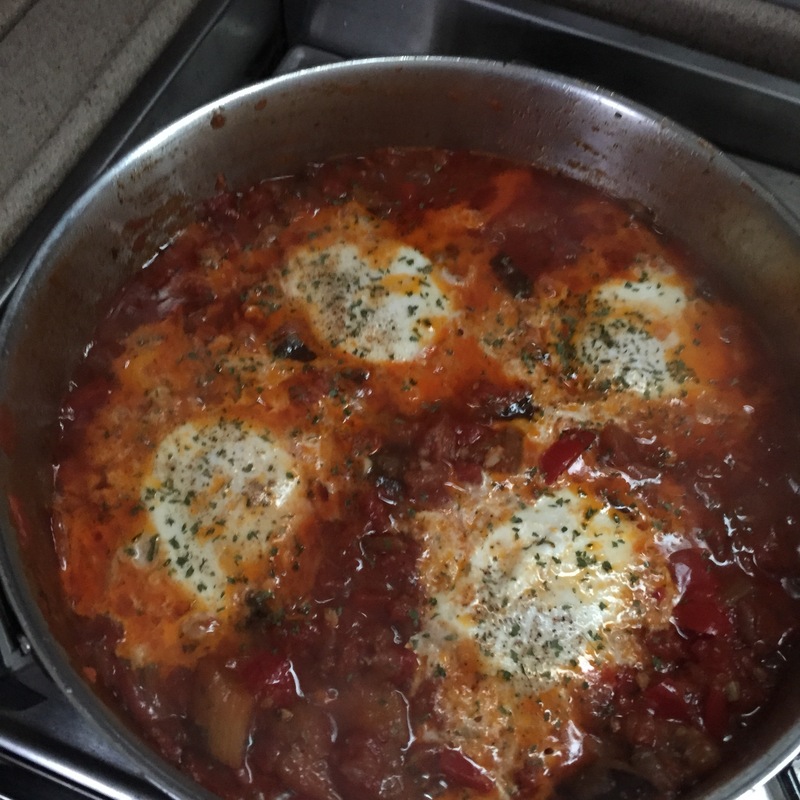 We had an eggplant and a few red peppers that needed to be used while they were still fresh so I decided that it would be a perfect excuse to try making Shakshouka in the boat galley. I first tried it when we visited Ed’s aunt and uncle, Susha and David, in Miami back in March. A number of us flew in to celebrate David’s birthday and Susha had lots of food made for an entire weekend for everyone to enjoy, including the Shakshouka. I fell in love as soon as I took the first bite. Not only is this a very hearty meal, typically eaten as breakfast, but it would also be perfect for our passage from Deltaville, VA towards Norfolk the next day. 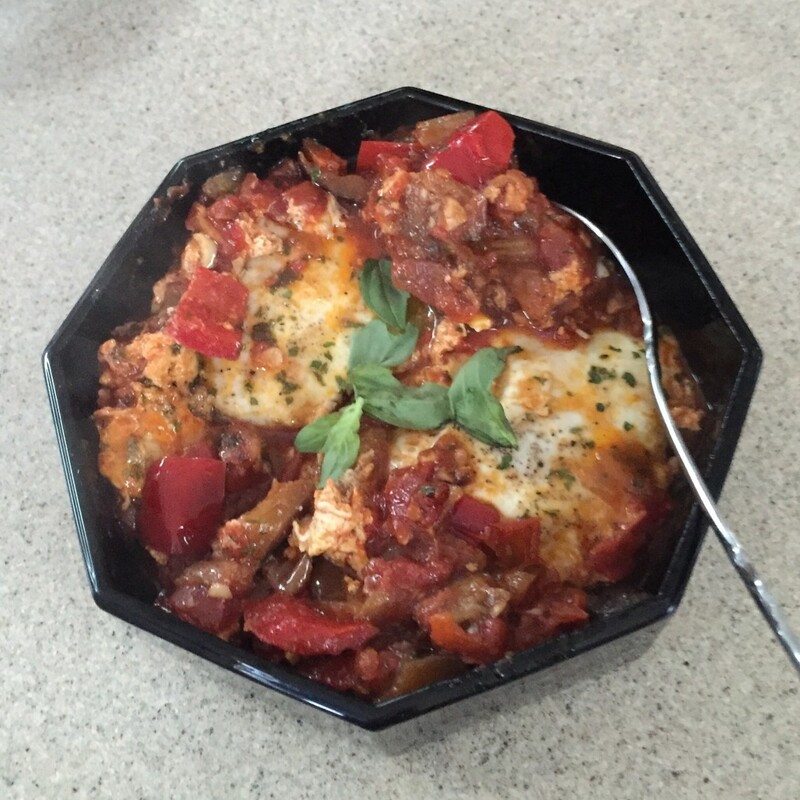 I took to Internet to find a recipe and most were not using eggplant or red pepper. I found one recipe that sounded amazing on the blog At the Immigrants Table and modified the recipe a bit from there – the blog post alone was a great read. Dice onion into small pieces, place 1 tbsp of olive oil into heated pan. Sauté onions on medium heat until golden – about 7-10 mins. 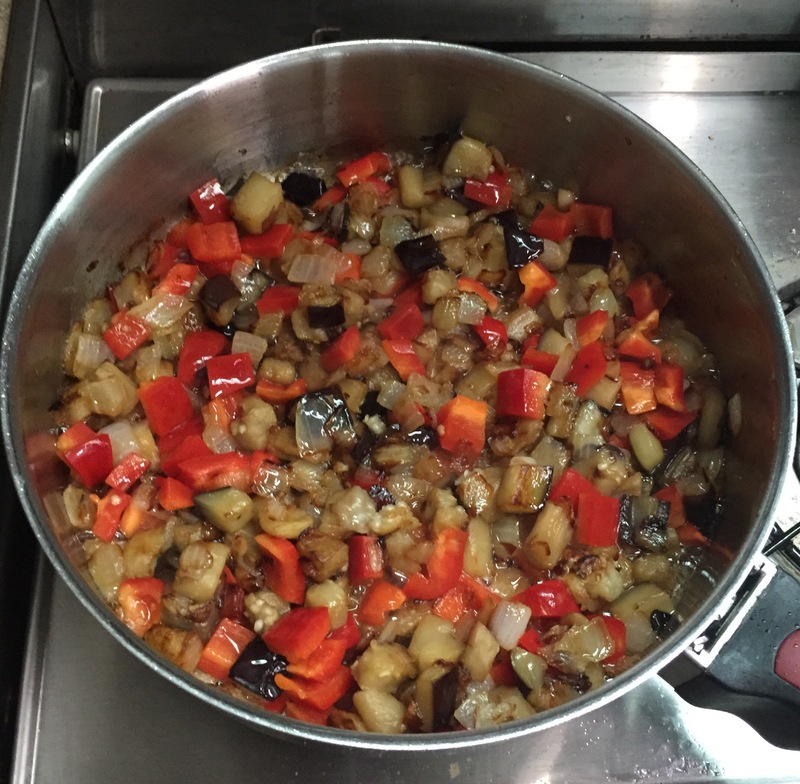 While the onions are cooking, dice eggplant into 1/2 inch cubes and red pepper into similar sized pieces. Once the onions are golden move them to the side of the pan. Add 1-2 tbsp of olive oil and drop the eggplant cubes into the oil taking care not to overcrowd. 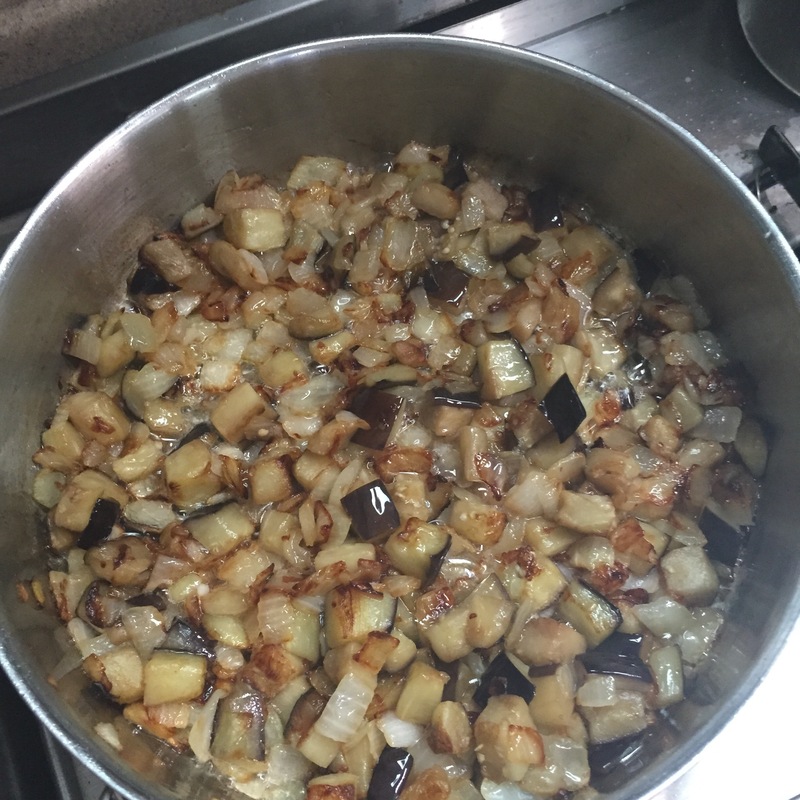 As the eggplant is beginning the brown (1-2 min), you can start mixing it in with the onions and making room for the remaining eggplant cubes, if needed. Let eggplant and onion brown on medium to low heat for another 7-10 minutes, stirring occasionally. Stir in red peppers and continue to sauté for another 5-7 minutes. While eggplant is cooking, dice the tomatoes. 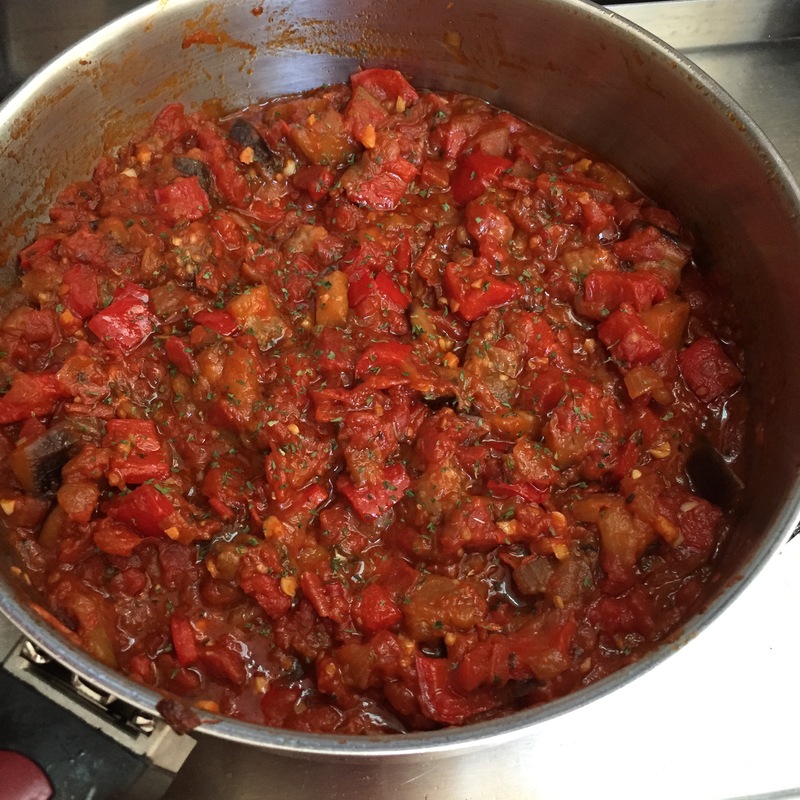 Once the mixture is browned, stir in the diced fresh tomatoes. Let their juices run out and use the juice to scrape all the carmelized yummies from the bottom of the pan. Stir in the canned diced tomatoes. Let the mixture cook for another 10 mins covered on a low heat, stirring occasionally. In the meantime mince the garlic. Add the salt, garlic, smoked paprika, chipotle chili pepper, sweetener to the pan. Add the lemon juice. If you are using dry parsley flakes you can add them now as well. For fresh parsley, add at the end. Continue cooking on low heat until most of the liquid is gone, about 5-10 mins. Once hot, make a well with a spoon and drop an egg into each well. Sprinkle a dash of salt and ground pepper onto each egg. Cover with lid to help the eggs cook through. Cook until the desired egg consistency – about 5-7 min. It’s best to let the yolk still be a bit runny. This recipe serves two. Place the eggs and more store into a bowl, sprinkle with fresh parsley (optional) and garnish with a sprig of fresh basil. 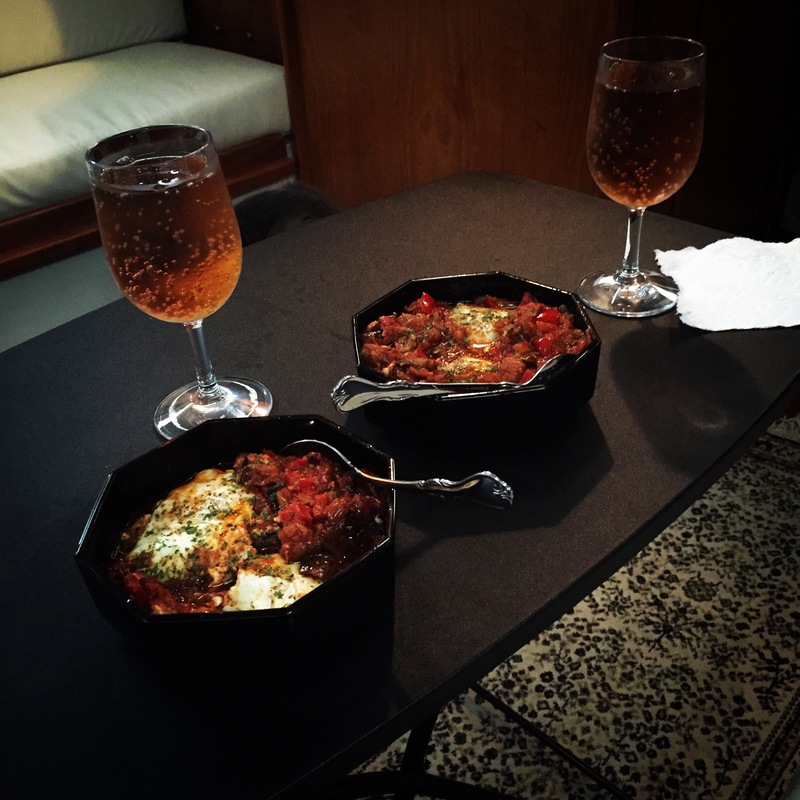 So whether you need an easy make ahead meal, a hearty dish for a rainy day or unto use up some of your veggies, this is pretty easy and simple, even in a boat galley. Enjoy! Next Next post: One Month In! Like your dish love egg p will try it soon the eggs make in interesting. Things are great! Waiting out the weather in Oriental, NC this weekend. Heading to Beauford next. The last sail must becoming up in a few weeks. We will be there in spirit!